For patients and clients at a higher risk of pressure sores, it's vital that effective pressure relief can be provided to match their needs. The Casa Very High Risk Pressure Relief Geltex Mattress uses Geltex material to provide an exceptional level of pressure reduction, suitable for those at high to very high risk of developing pressure ulcers. 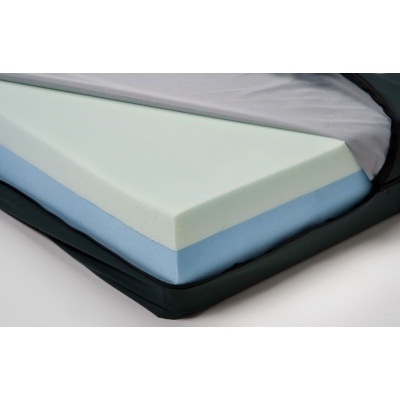 Using a foam base and a Geltex top layer, the mattress provides a fantastic level of pressure reduction. Geltex features a unique formula with gel properties, enabling it to distribute pressure evenly and support the body while also maintaining a high level of patient comfort and breathability. It even provides pressure care to problematic areas such as heel zones, delivering an extra level of pressure distribution. To help you ensure hygiene is maintained and to protect the foam, the mattress includes a vapour-permeable PU-coated cover. Easily washable, it helps make infection control and hygiene maintenance easier.